Ookpik's Negativity: What Kind Of Pickup Truck Is That? What Kind Of Pickup Truck Is That? Does anyone know what kind of pickup truck this is? The toy truck in the foreground looks similar to the pickup. 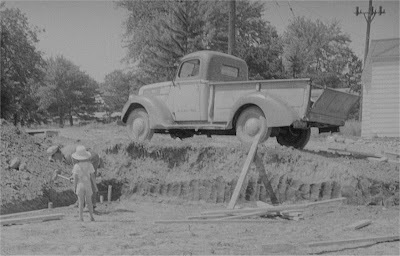 The pickup has been identified as a 1940 or 1941 3/4 Ton Ford. Thanks to Lamar for the identification! It looks to be a 1938 Ford.